From producers Steven Spielberg and Oprah Winfrey. 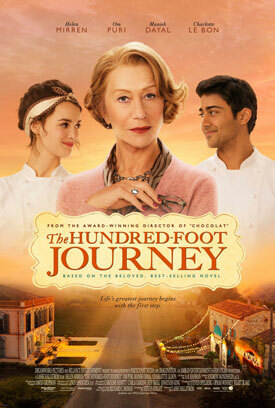 Helen Mirren, Om Puri and Manish Dayal star in The Hundred-Foot Journey, based on the best-selling novel by Richard C. Morais. The opening of a new Indian restaurant in the south of France, next to a famous Michelin-starred eatery run by Madame Mallory (Mirren), is nearly cause for an all-out war between the two establishments. MPAA Rating: (PG) for thematic elements, some violence, language and brief sensuality.